Having trouble talking to your webserver? Seeing the aforementioned errors? Are you hungry? I can fix two of those. I ran into this error at a large, highly distributed client site. Because of the nature of the problem (sporadic) it took longer to solve than I would have liked. Hopefully this article will save you that time. This error involves two sides: a "client" and a server. Client is in quotes because it can be, and often is, an application consuming a web service or similar. On the server side this problem generally occurs on Windows 2008 or newer. The "client" can be any platform. 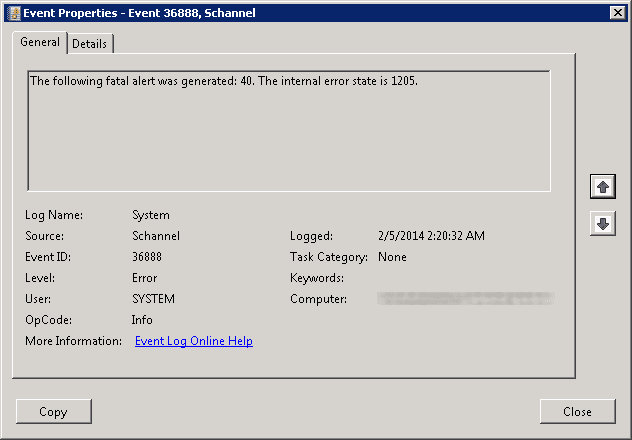 These errors can occur on either side, provided obviously that side is Windows. What errors you receive on the other side depend entirely on the platform. The client and server must agree to the same implementation of each of these items. Bundled together, these are referred to as a cipher suite. The client and server each have preferences as to which portions of the cipher suite hold which priority. Based on this prioritization, a set of supported cipher suites is compiled and proposed at the beginning of any SSL/TLS connection. The client first proposes what it would like, then the server compares the client list to its own list and selects the first matching suite. So therein lies the problem: Your server doesn't like any of the proposals from the client. Your template for the CSR is "quite short"
Feel free to skip this section if you want to jump to the fix. Detection can be pretty easy using tools like Wireshark. Fire up the tool on either the client or server with the proper capture filters to reduce noise, and then attempt the failing connection. You will see only a handful of packets (5 or so) as the rejection happens pretty quickly. To see the detail appropriately, you'll need to tell Wireshark this is SSL/TLS by right clicking->decode as->SSL. If a protocol negotiation is the issue, you'll see the connection reset by the server immediately after the client suggests a list of cipher suites. This packet from the client will have the info of "client hello" followed immediately with a TCP RST (reset) from the server. If you drill into the details of the "client hello" packet you will be able to see the suites the client is proposing. 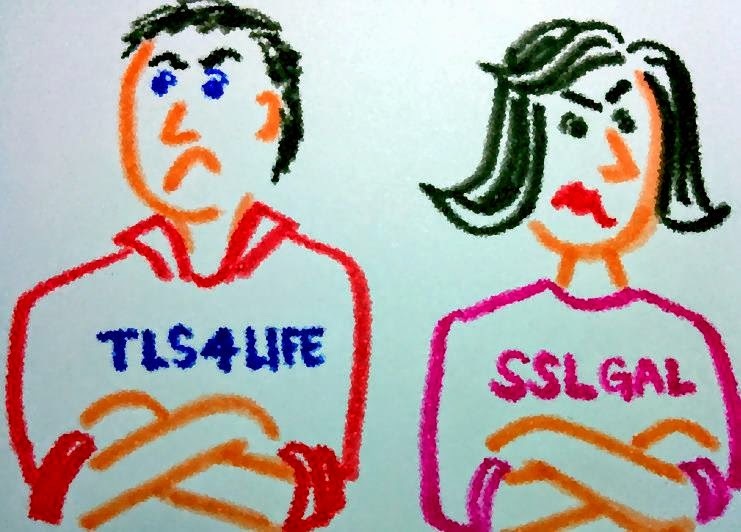 You can then attempt a successful TLS connection if you are able to produce one (if not just jump to the fix and try it) using the same methodology. 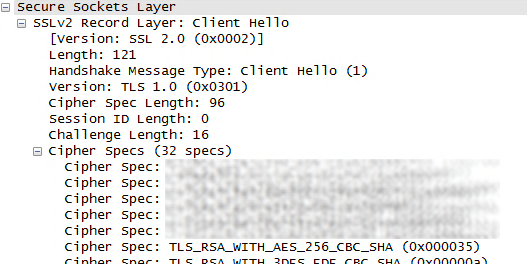 I found that while using the affected cert type listed above, my server only supported TLS_ECDHE_RSA_WITH_AES_128_CBC_SHA and TLS_ECDHE_RSA_WITH_AES_256_CBC_SHA, clearly a very limited subset. To remediate this issue you'll need to make sure that certificate ordered is for the correct purpose. Rather than recreate that article I'll direct you to my favorite one here, however note that the [strings],[Extensions],and [RequestAttributes] sections may not be needed depending on your situation. The main takeaway from that article is that at the very least the KeySpec and KeyUsage settings need to be specified (see link under references for more info). Request, retrieve, and install this certificate. You can use any other method you would like to obtain a certificate (perhaps you do), but it's critical to ensure your request has the correct parameters including the certificate usage. If you are using Windows PKI with AD integrated templates, you can "hard code" this in the templates if you like. As a security best practice, you should also control (restrict) your available cipher suites on Windows/IIS. This is pretty easy to do; it can be done via Group Policy for large sets of servers and one-by-one with registry settings or better yet with this easy tool from Nartac. For more guidance check out these three links. Thanks for reading and feel free to add your own experience below! Thanks Greg, I'm glad it helped! 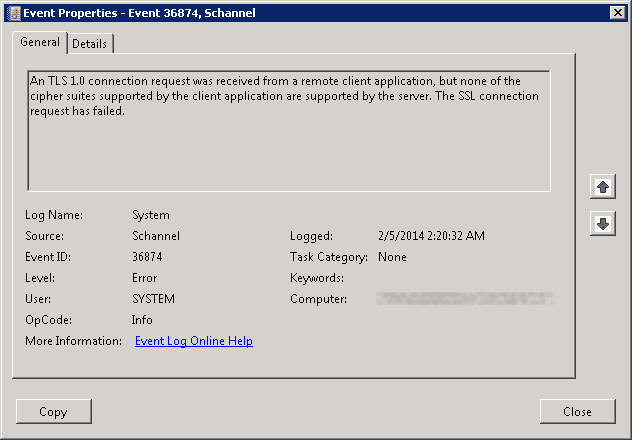 Hi Toby, i am facing the same issue Event 36888 issue in my win server 2012 r2. i have no hope to resolve this issue. kindly help me how to resolve this issue. im using this server as my dbsvr in my domain. I'm getting this on a Windows 10 PC. It will no longer connect to any HTTPS://, nor allow email, which is driven (in our Organization) by Smart Card Authentication. Last Thursday it was happy, Friday, not so much. No updates or driver changes that I can see. Wouldn't this error also occur if you are restricting the less secure cipher suites for security purposes (like PCI compliance) on the server but the client browser/OS doesn't support the restricted cipher suites the server is configured to negotiate? I've seen alot of articles on this but no one seems to point this out. In these cases you want the ssl negotiation to error out and it's on the client to update their system. For example I've traced these errors back to clients using Win XP machines using IE v6/8 or old phones browser that only support TLS 1.0 trying to browse a https website with TLS 1.0 disabled and less secure cipher suites disabled to be PCI compliant.